This entry was posted on November 29, 2011 by ScanTool.net Team. 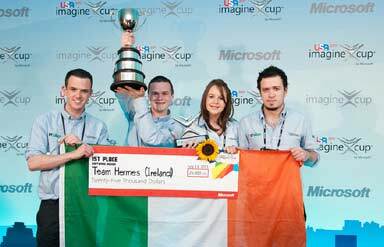 Team Hermes, a group of 4 students attending IT Sligo in Ireland, won the top prize at the 2011 Microsoft Imagine Cup in New York this month with an innovative project that addresses the global issue of road safety. Their pioneering solution utilizes a vehicle interface that monitors dangerous driving behavior and road conditions, giving instant feedback to the driver and vehicle owner. The vehicle interface uses OBD Solutions’ STN1110 technology to extract data directly from the vehicle’s on-board computer. The collected data is then processed and analyzed using Microsoft’s Windows Phone 7, Bing Maps, and the Windows Azure cloud computing platform to change driving habits and reduce road deaths. Team Hermes won $25,000 with their victory. Vitaliy Maksimov, General Manager of OBD Solutions, said “The guys earned the victory with persistence and hard work. I am very happy that we could, in some small way, participate in their success." OBD Solutions produces components and innovative turn key solutions that utilize legislated OBD-II protocols to deliver a wealth of useful diagnostic and engine performance data. Read more about the company’s products and services on their website ( www.obdsol.com). Microsoft produced a Team Hermes project overview video, and you can read more about the team on the IT Sligo website.